I love my country, but when it comes to two topics very near to my heart, gender issues and pet-friendliness (not necessarily in this order), I feel that Japan is still far behind than most countries I’ve lived or traveled to. Yes, Japan has thousands of pet shops, 8.9 million dogs and 9.5 million cats living as pets as of the latest data from 2017, and billions of cosplay ideas and products to dress your pet for special and not so special events, but when it comes to going out with pets as a family, places are limited. If you’re like me and hate leaving your pets behind every time you go out, here’s a helpful guide to ten of Tokyo’s best places to go with your cats, dogs and any other ‘safe’ pets. Yasaiya’s savvy vegetable sommelier carefully selects the best veggies from Japan’s fresh farms all the way from Okinawa to Hokkaido. 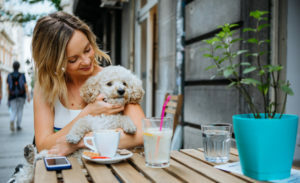 Your pet can sit next to you on the bench cubicle and enjoy a delicious meal together from their rather long dog menu. There’s also a private room that seats about five people and pets. If you book in advance, they can provide a birthday plate for your pet’s birthday. For pet owners, I personally recommend their A5-rank wagyu and delicious garlic rice at dinner time. Their freshly squeezed juice is also a must-try. Lunch sets are very reasonable — around ¥1,000. My favorite is their Salzburg steak with a selection of five sauces. They also have a massive fresh salad served with seven different original dressings.